Zajel means communication and peace and this is what Zajel taught us. 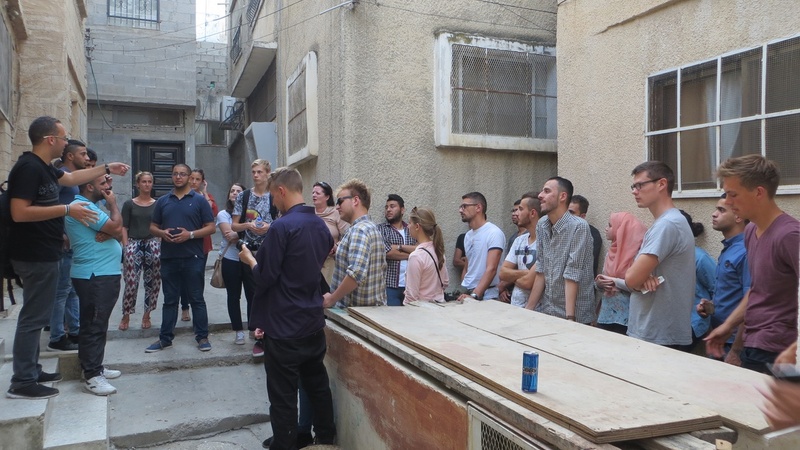 Starting our time in Zajel ‎by showing us around the Balata Refugee Camp, Ramsis, a committed local volunteer, ‎introduced us to the historic conflict in this Holy Land. Balata Refugee camp is the new home to thousands of the Palestinian refugees. Since (Nakba) the catastrophe of the 1948 the Palestinian people from the city of Jaffa are living in Balata refugee camp on the smallest amount of space and privacy, suffering deficits of electricity, water supply, medicine and above all, education. On the other hand at An-Najah-University there are more than 20.000 students dedicated to study in order to challenge the present and to shape the future, as the University Motto says. During the workshops; The international volunteers were able to give the students a chance to ‎develop their skills, such as English Conversation, Public Speaking and Debating skills. To be ‎honest their knowledge of the English language was way better than I had expected and they ‎sometimes just needed to be heard. The fellow Palestinian students were full of ideas, creativity ‎and dreams and it was a stereotype breaking experience to hear them talking about becoming a ‎civil engineers or an English teachers. I have never seen such warm, friendly and hospitable people before. Where ever we were going ‎for two weeks, the people received our group of volunteers with open arms and a hot cup of ‎Arabic coffee. During our visits of families who are suffering of demolished houses by the Israeli ‎army or people who are suffering the lack of water, people never refused to give us a detailed ‎idea about their situation and even the farmer of a smallest land offered us to taste his one of ‎delicious fruits while showing us how he tries to make the most out of his situation. These gestures in spite of all the difficulties ,caused by the Israeli occupation the people are ‎facing, were the most impressive impressions.